I grew up on crossover foods in the US; that means the American version of only the most famous dishes from each region. That’s well and fine for a sample and an “exotic” dinner when my taste-buds are bored back home, but the real thing is so very, very different once I ventured out on my travels. I have found this is the case with Thai food, as well as the Middle Eastern vegetarian foods I sampled throughout Jordan. The problem with this food pattern though, is that I was left completely unfamiliar with cuisines that never made the leap across the many oceans and seas. It wasn’t until I lived in Chiang Mai for about nine months out of the past year, that I happened upon Burmese food. Once discovered, dishes and flavors from Burma have become a passion and my Burmese friends ensured I spent my time sampling delicious dishes, salads, and flavor combinations my palate had never considered. These same friends prepped me with advice on ordering vegetarian food, what to eat, and how to find safe street eats for my travels earlier this year in Burma. Actually eating vegetarian in Burma, though, was a bit trickier than sampling it in nearby Thailand because of language differences, sanitation standards, and regional variances. Are there inherently vegetarian dishes in the national cuisine? Can I eat the fresh fruits and veggies without risking contamination from the water used to clean the food? Is vegetarianism understood and accepted? We’ll cover the answer to each of these, as well as a thorough guide to vegetarian dishes, below. 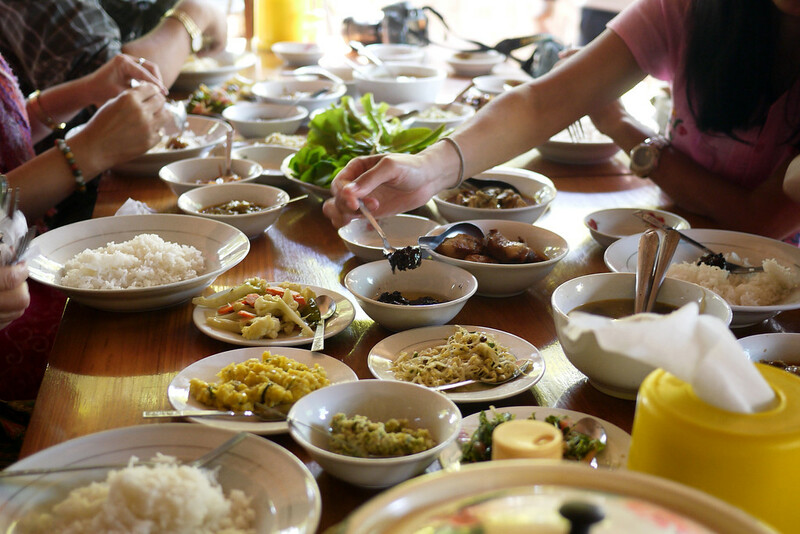 A family style buffet lunch at the Golden Myanmar restaurant in Bagan. Wondering how to say vegetarian in Burmese? 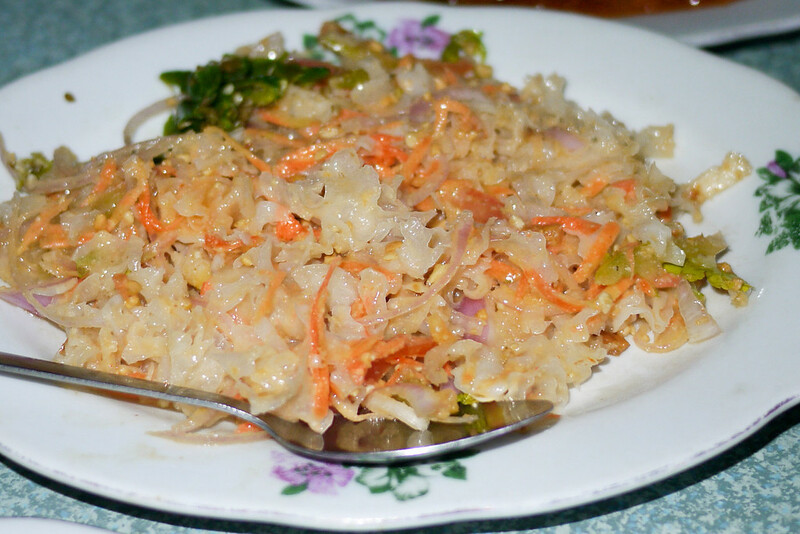 Recipes & Ideas to Enjoy Vegetarian Burmese Food at Home! Can I emphasize again how wonderful it was to sample the street food stalls throughout the country? The Burmese were friendly and fun throughout every meal, and Ana and I felt immersed in the culture packed into tiny stools, crouching and eating among the locals. This is where the conversations happened, we watched what other people ordered, flocked to the crowded places, and enjoyed the accidental orders when what we got didn’t measure up to what we expected (in fact, there are still at least three or four meals I ate for which I have no name, nor any idea how to re-order it!). Ana ate veg for a lot of our travels (by choice), but meat options abound. If you’re traveling Burma with a meat-eating friend, check out these three food guides: here, here and here. 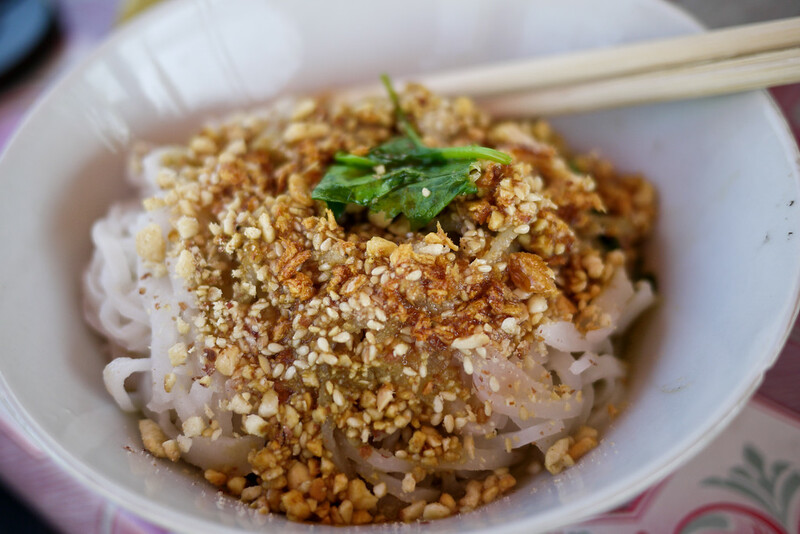 In this guide, we’ll cover all the major areas of Burmese cuisine I managed to hunt down and find while I traveled in the country. As well as how to say vegetarian and some quick tips to familiarize with the food culture in Burma. The guidebook used another long-winded expression for vegetarian (something for “I cannot eat meat), but “thut thut luh” translates as “lifeless,” and when used with food it is immediately understood with absolute clarity and applies to all meat. It’s easy to say, but hard to put the sounds into the Roman alphabet, so have your first guesthouse teach you once you arrive. Note that I never got served meat when I said it, and even in this list of dishes, always order the dish, then specify “thut thut luh” to make sure that they do not add in fish sauce, shrimp paste, etc. This is not a guarantee on the shrimp paste/fish sauce, it really can depend on how well the cook understands Western vegetarianism. I will say this, I never tasted it in the dish, so if it was there it was very light…my philosophy is to do the best I can, but not to ruin my travel experience by refusing to eat foods that could have traces of fish products since it is SO prevalent in Asia. Before we get to the photo breakdown and descriptions of delicious vegetarian Burmese eats, here are some things you should know before you go for any travelers in Burma, not just vegetarians! Breakfast and lunch are the bigger meals of the day; follow the local custom and eat food earlier in the day, when it’s freshest. Hot, fresh street food is safest (even better if it has a long queue!). Tap water is not safe, but the large jugs of water in front of many businesses are a unique Burmese kindness and are safe, free, and encouraged if you need a glass; they place the water curbside to help people stay hydrated in the often extreme heat! State your case upfront about being vegetarian, they will smile, laugh and easily acquiesce once they understand. Rice is the base of most/many meals. Except for in the case of soups, you’ll be served rice with almost every meal. Venture out for breakfast. Nearly every guesthouse serves a boring egg and white bread breakfast, the locals are eating a lot better than that if you venture to the street stalls! The tea on your table is free. It’s usually a fairly bland/weak Chinese tea and it’s a safe way to hydrate since it’s served hot and sealed inside the tea canisters (be sure your cup is dry though when you start pour it though). We’re ready to get started with the food! As a disclaimer, I’m not Burmese, so these descriptions and dishes are given to the best of my ability! Once you’re there you can sample and discover many I no-doubt missed on my trip. And, if I got it wrong, or you have an amendment to what I said, let me know so I can fix it! And now I feel it behooves me to warn you: when you finish reading this photo food guide, you’ll be hungry! Soup is a wonderful and usually very safe meal throughout Asia because they boil ingredients just before serving the soup piping hot. If your soup is luke-warm, particularly if you are eating at an off time of the day, consider a pass (but pay for it if it’s at your table) and find a boiling-hot soup option. 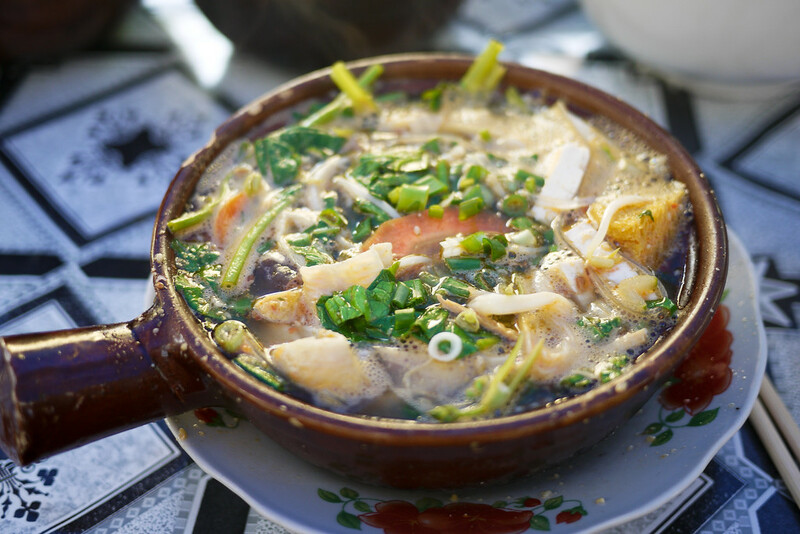 A traditional Shan soup, severed in the morning, but also throughout the day, at Inle Lake, Burma (Myanmar). 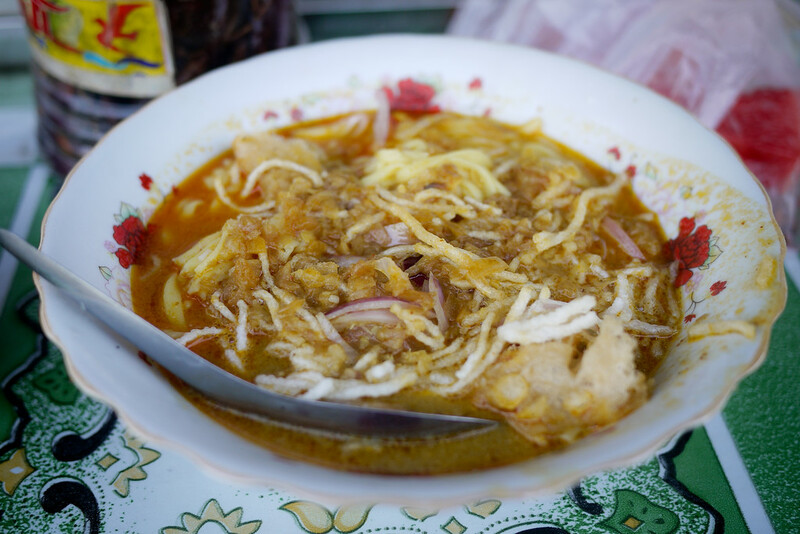 Mohinga, pretty much the National dish of Myanmar, this is a mild fish soup seasoned differently each time, with crunchy additions, thin noodles, and dried fish chunks occasionally added. Not vegetarian, but one for the pescatarians to try. 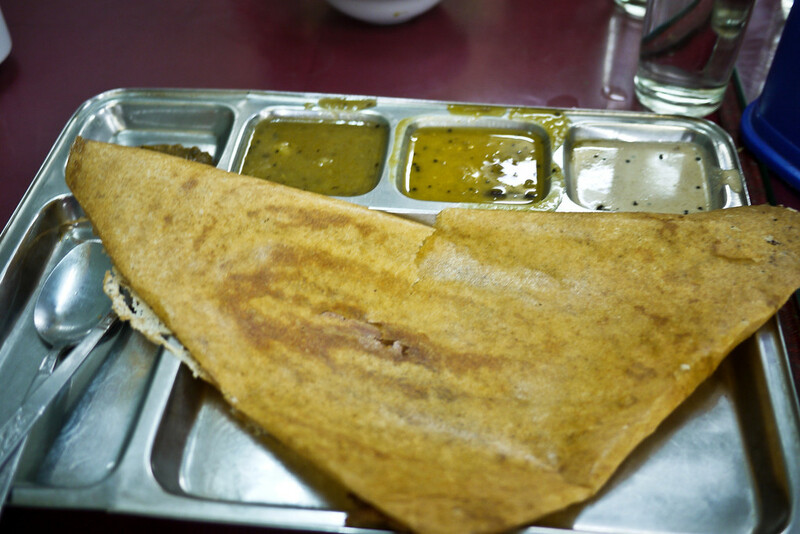 This is often served at bus-stop restaurants and late at night road-side stops! 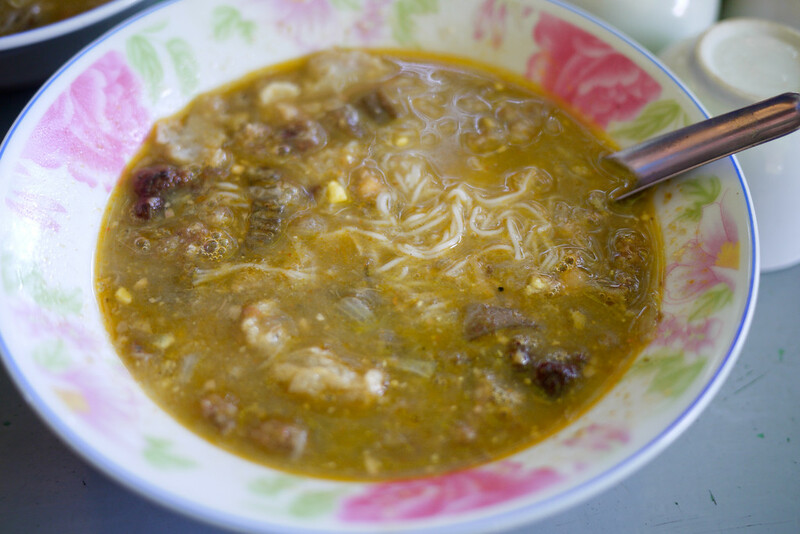 I consider myself a flexitarian, so I sampled this soup several times throughout Burma from my niece’s dish. Though it’s a common breakfast food, we also ate it all throughout the day at bus stop food stalls. It’s not much to look at, but it is full of flavor and spices. It’s also a great warming dish if you’re traveling up in the cooler north! 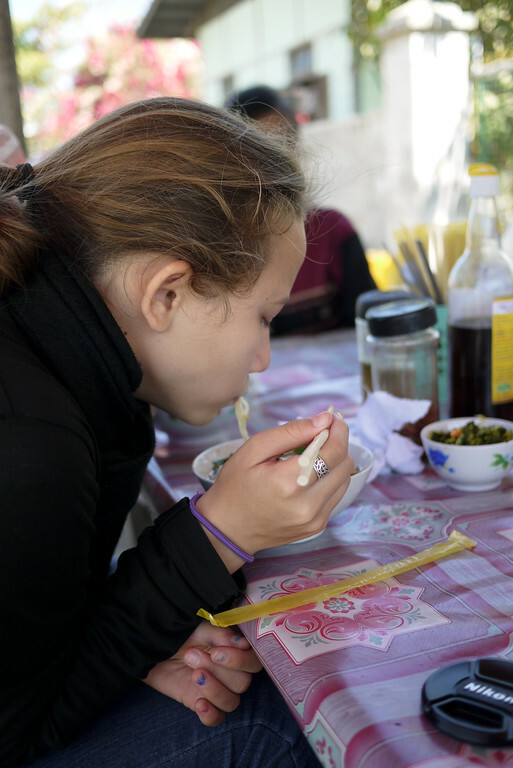 Noodles, basic tomato paste, some crunchy fried beans fritters, and hot broth made this Ana’s favorite breakfast. We ate this daily in Hpa-an. At its most basic, it’s tomato sauce and pork, so make sure you order it “thut thut luh” to get a vegetarian version! It’s often a bit drier when ordered elsewhere in Burma, and tastes different once again when ordered in Shan State, but the beaming vendor next door to the Soe Brother’s Guesthouse in Hpa-an sold us on this delicious dish for breakfast; I think his conversation and tips went just as far as the soup in starting our day out on the right foot! Where: Small restaurant with chairs on the street-side counter that is just next door to the Soe Brothers’ Guesthouse in Hpa-An (which is where you should stay if you visit!). Bubbling and boil hotpot dish on the streets of Yangon stuffed with veggies, bamboo hearts, mushroom and tofu! Hotpot food stalls lined the streets of Yangon in particular, so when we were hungry we would simply walk up to these, point at the delicious veggies and spices, say “thut thut luh,” then they served a tasty steaming hot bowl of tofu, noodles, and fresh vegetables. Expat Kyle noted that: “Myae Oh” is the clay pot and “Myi Shae” is the name of the curry/sauce. And a Burmese reader emailed in to tell me that this is a popular Chinese-inspired street food dish. Where: All over the streets of Yangon we found long tables with a family working the small fires with bubbling bowls of hot soup and vegetable. This is the part of Burmese cuisine that delights me the most. The flavors in Burmese salads are quite unlike the lettuce/leafy salads common in the west. Instead, these salads blend a range of veggies, nuts, and flavors. Combine unique textures. 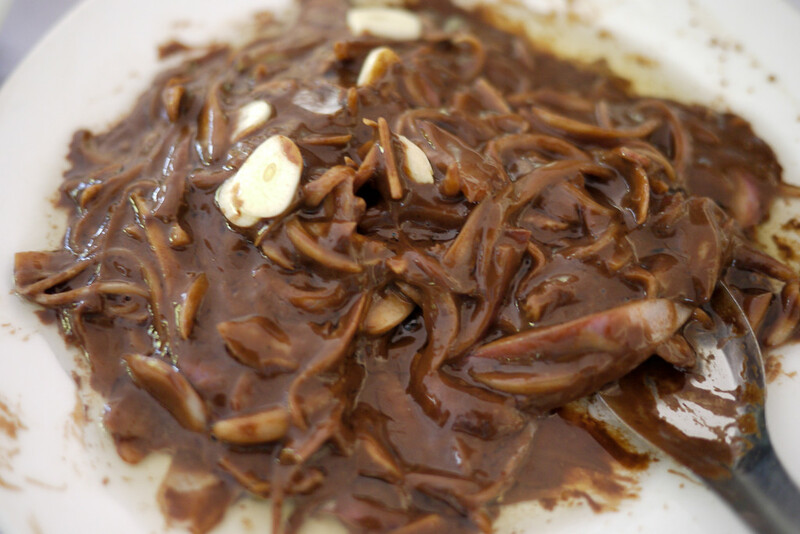 And then hold it all together with oils, tamarind juice, lime, fried garlic, and nutty dressings. Food handling standards are still questionable at times, so this is where it gets trickier to eat safely (since locals may wash fresh veggies in local tap water, or mix the dish with bare hands on the streets). I paid attention to where locals ate, mostly chose salads when at restaurants, and generally lucked out with no one in our group getting massively ill even once). Note that the Burmese word for salad is something along the lines of: thote, thoke, or thouq when written in the Roman alphabet. A delicious fermented tea leaf salad mixed with tomatoes, ginger, crunchy mung beans, fried garlic, toasted peas, and various other ingredients to flavor! This is a top five favorite for me and for good reason–it’s spectacular. The base of the dish is fermented tea leaves, which are a very, very strong and unfamiliar flavor at first. But local cooks mild the flavors in the with the addition of nuts, cabbage, tomato, oils, and various other bits and bots (mung beans, ginger, sesame, bean sprouts, and green tomatoes, among other things, have been known to make an appearance in various iterations of this dish. If there is a cross-over item that you may have sampled from Burmese cuisine, it’s probably this one! 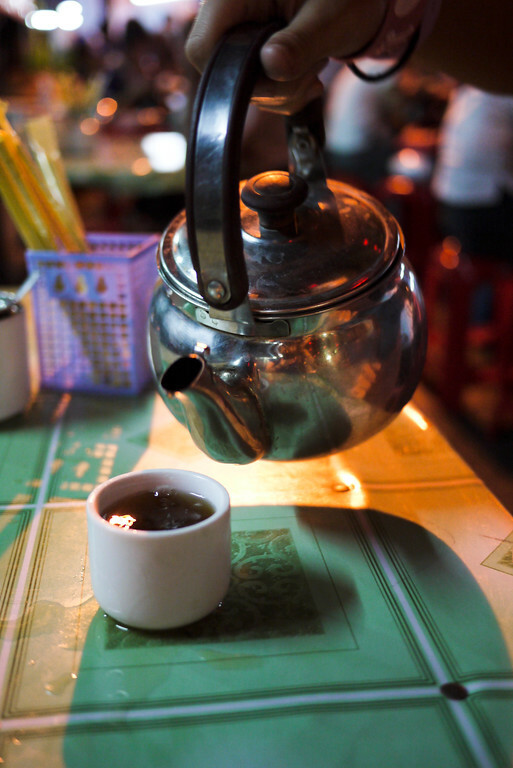 Of note is the fact that tea leaves are very high in caffeine, so choose wisely the time of day you consume it! Also, if you want to try it at home, I found a great recipe online. A delicious pennywort salad; this is the best shot I managed since I was usually too busy inhaling it to grab a proper photo! Ingredients vary but include onions, pennywort, nuts, and oily dressing. Tart and delicious, my palate delighted at the new combination of flavors in Pennyworth salad. The dish combines the bright green pennywort plant, lime, toasted sesame, turmeric oil, garlic, tomato…the list goes on, once again, according to local flavor preference. This is a favorite of mine–please seek it out and give it a taste. If you haven’t tried pennywort before (and I certainly hadn’t thought it any more than a weed in my garden) then you owe yourself a taste! Check out this recipe to try and make one at home. 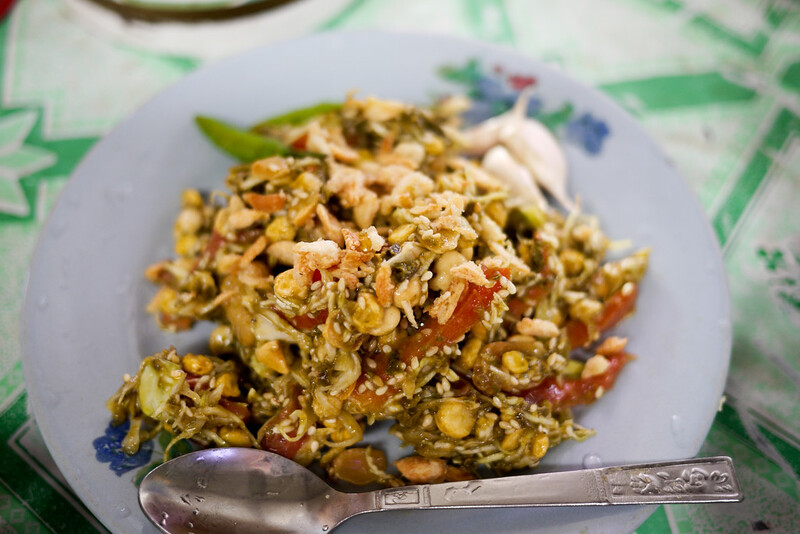 Shan tofu salad in Nyaung Shwe, near Inle Lake in the Shan region of Burma. 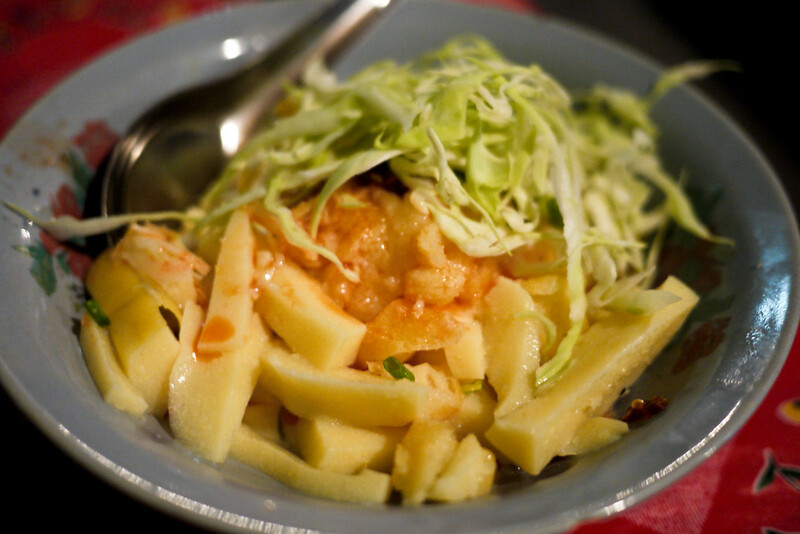 A delicious yellow tofu, sliced and complimented with cabbage, nutty sauce, and spicy chili paste. Think of this as an inverted tohu nway Shan soup. 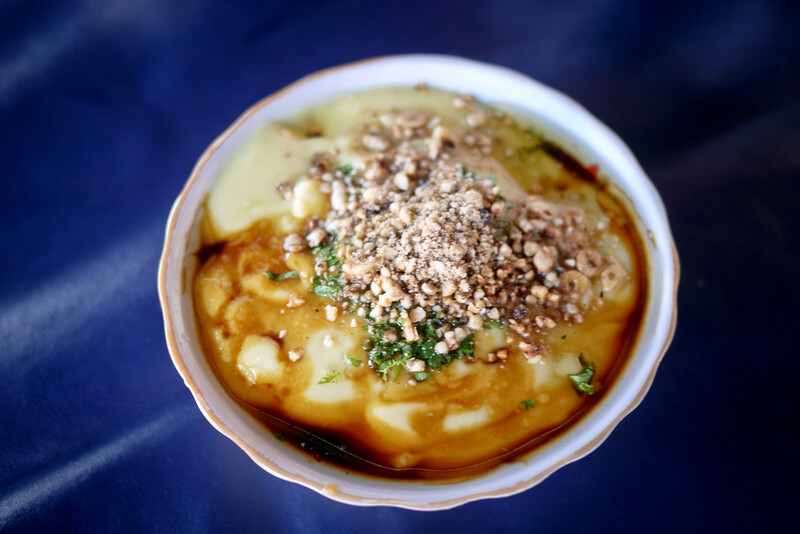 It’s the same yellow tofu, but instead of liquid and soupy, the tofu sets firm, and is then sliced and garnished with cabbage, spicy chili paste, pickled veggies, and nuts/seeds/parsley. Really anything the local cook prefers is an accent flavor. Where: Inle Lake is the Shan region of Burma so this is where you can most easily find the dish. Ana and I also hunted down several Shan restaurants near the ET Hotel in Mandalay. A tasty treat, but not one for which I have a photo. Imagine it much like the rest of the salads in Burma, it’s shredded ginger and the ingredients added to it depend on the region and your cook’s taste-buds! 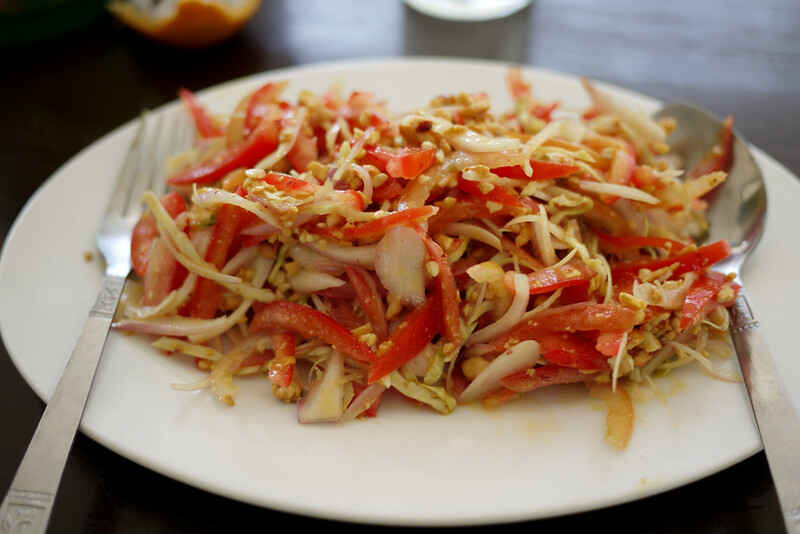 If you’re keen to try this one at home, here’s a tasty sounding Burmese ginger salad recipe. I have a love affair with tomatoes, it goes back about a decade (before that we were fierce enemies) and now we’ll never part ways. For that reason, I adore this Burmese salad. It usually consists of tomatoes, onions, crunchy peanuts, sesame, and oily dressing of some sort. And that’s it. It’s so good with a bowl full of rice and worked well as a compliment to many of the warm foods I tried. This was, admittedly, not my favorite. Though I was on the fence when I first tried it, by the end of my time in Burma I appreciated the tart, tangy salad as a compliment to the rest of my food. Give it a try, since it’s a favorite of my friend. 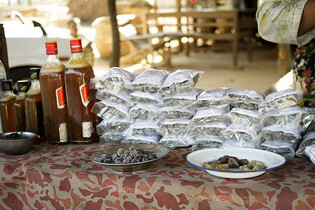 I’m told it’s trickier to find, but we sampled this throughout central Burma, in Bagan and Inle Lake. A ground bean and onion paste with a very potent flavor ; it’s delicious mixed in with your rice and other dishes! Pone Yay Gyi is a bit regional. 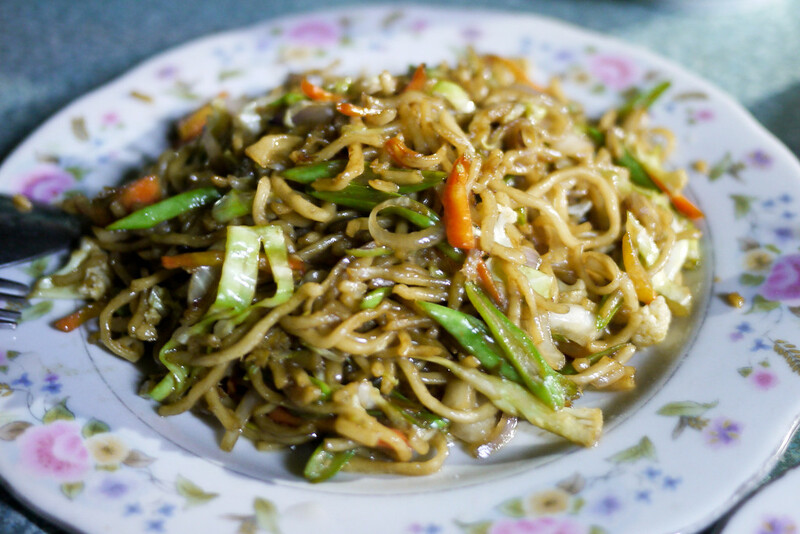 You can definitely find this dish in the Bagan area. It’s a thick, salty dish made from fermented soy beans usually. It’s a delicious condiment to sample with other dishes, or mix into your rice for an extra jolt of flavor. Burma is blessed with a huge range of cultural influences based on its history and location. The Chinese influence is strong in the northern border regions, and many dishes and customs flowed into the rest of Burma. This is the case with Indian food and culture as well. Yangon is a haven for Indian food lovers, Mandalay as well, and small restaurants and influences can even be found in small towns all over the country. Then, beyond these influences from other countries, Burma is home to a range of ethnic minority groups with their own customs, language, and foods. In short, this list of foods is so long because the country is rich with flavors and international cuisine influences. Pretty standard fare in the tourist spots, we ordered this as a good filler that was tasty, filled with veggies, and pleasing to both the kiddos (Ana and I traveled with a Burmese friend of mine and her daughter while we were in Bagan and Inle Lake). Delicious Shan food at a street stall near Nyaung Shwe, on Inle Lake, Burma (Myanmar). 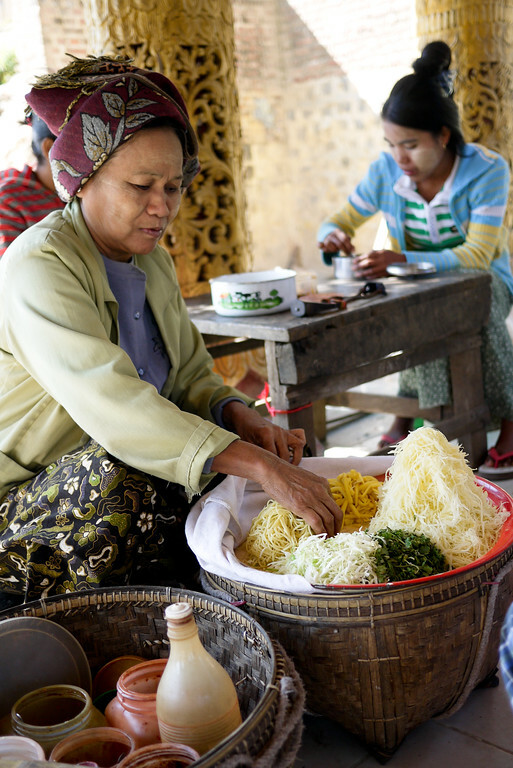 Noodles are a staple in the Myanmar diet, right under rice as the main source of food. The Burmese severed us boiled noodles, fried noodles, noodles in salads, noodles with crunchy toppings. In short, noodles abound and the toppings and varieties about. This one is particularly tasty with fried garlic, sesame, and other seasonings. 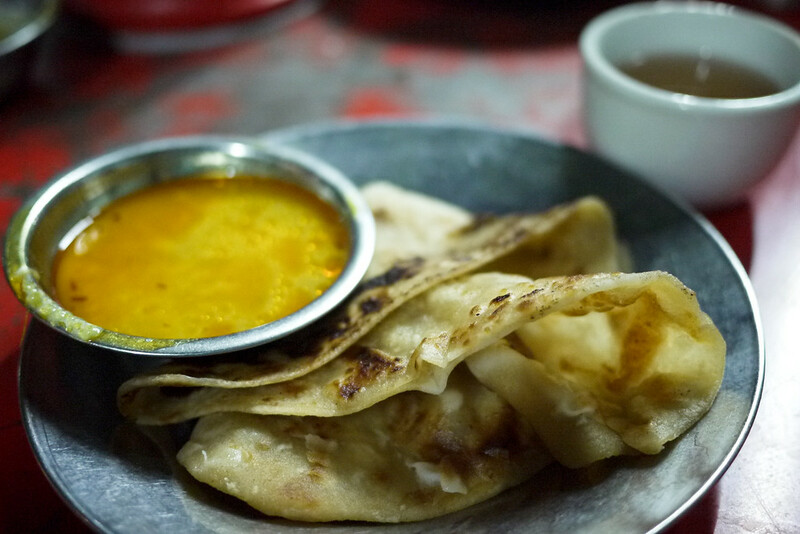 A too-hot-to-hold fresh chapati served with dhal from a street stand in Mandalay. I converted Ana to what I hope will be a lifetime affair with Indian food after our travels in Burma. 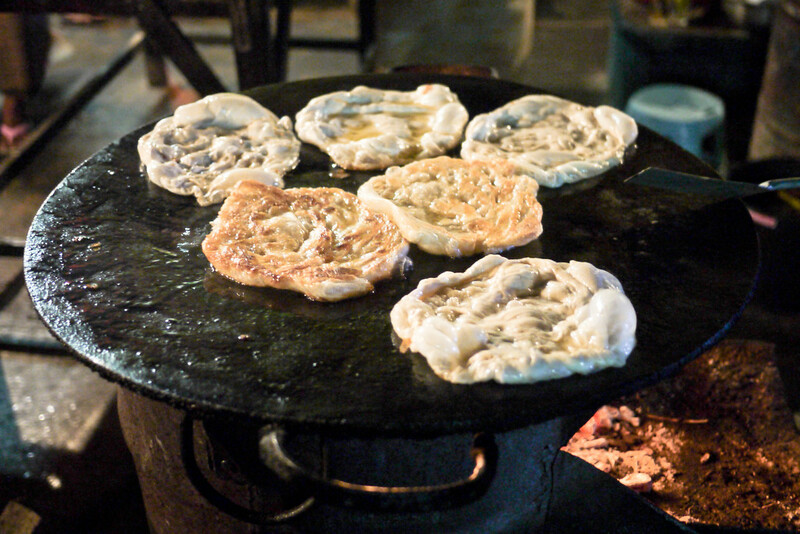 Mandalay was the best spot for a our street-side chapati stands. For about 20 cents we were able to get one piping hot chapati and one small dish of Indian food; on offer were: curries, dhal, vegetable, and a potato dish. We’d pick out six and go to town enjoying the flavors and fresh chapati bread. Where: No doubt the best stand we tasted was almost directly across from the ET Hotel (29A 83rd, Between 23-24) in Mandalay. A freshly made Indian dosa with warm dahl and a cool coconut paste in Yangon at the New Delhi Restaurant. Indian restaurants and options abound throughout Burma and they have the wide range of typical fare. There were dozens of restaurants in Yangon and an unlimited vegetarian thali ran about US $2 most places, with veg biryani, restaurants, dosas, and just about anything you love available on the menu. We found the best Indian food in Yangon and Mandalay, which is really no surprise since these are the two major cities. And it works out since some of the major other tourists spots you’ll likely hit have other regional vegetarian delights. Where: New Delhi Restaurant (262, Anawrahta St) in Yangon. Thinking we would outsmart the guidebook, we asked a lot of locals for the best Indian restaurant, and they all pointed to this touristy (but so cheap) hot-spot. Down about 10 doors is a fantastic biryani restaurant as well with vegetarian biryani (though they run out by mid-afternoon!). The Burmese like to snack from what I could tell! There was a huge range of deep-fried, pan-fried, and street-side snacks available all throughout the day. From the simple sweet or savory pancakes on the streets of Yangon, to the more complex flavors in samosas, we never lacked for food options. These deep-fried snacks were offered with nearly every meal and were frying on the side of the road throughout the evening. The bean ones were my favorites actually, and look out for deep-fried yellow tofu at the same stalls, it abounds throughout Burma! Order this one as you’d like it. We most often ate them with banana, though they are just as tasty if you opt for sugar, or even the savory one with beans! Where: The night market in Nyaung Shwe (Inle Lake) had a wonderful stand, fast service and all the Shan soup stands are just next door! These are also served at most tea shops if you ask! Never served to me when I was on my own, this was actually the Burmese breakfast served at our hotel (Westerners got eggs by default!). I doubt I ever would have found this simple breakfast dish if A wasn’t with me. She was served Kauk Nyin Paung for breakfast one day, while Ana and I were served yet another helping of eggs. Her’s looked a lot tastier, so from that point on, when possible, we opted for this dish! And as a bonus, A spotted a vendor from our early morning bus too; once we knew the dish was out there, we were able to pay closer attention and find it on our own! 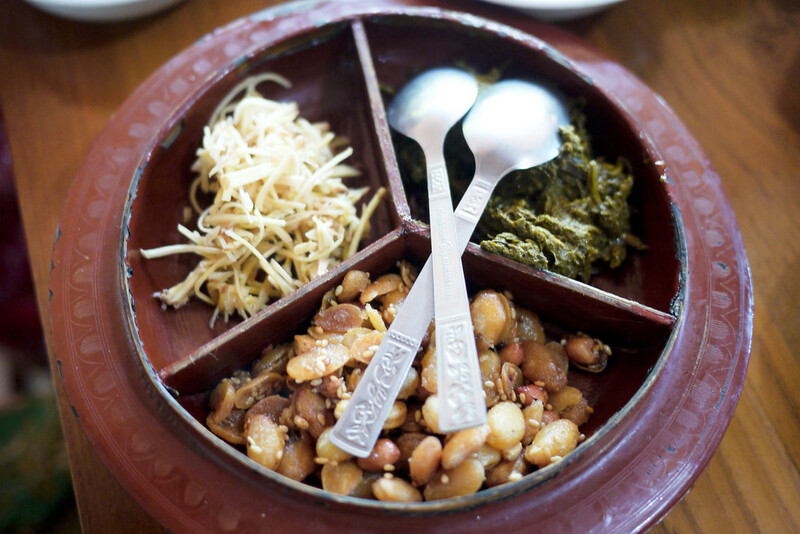 The Burmese tea leaf salad, served with fermented tea leaves, fried mung beans and other various crunchy nuts and seeds, and ginger. Not to be confused with the actual salad that comes out mixed together, this one has just three ingredients and is served as a snack/dessert, not a full part of the meal. The fermented tea leaves are very tart and strong, so mix to taste with the other ingredients when it’s served to you this way! 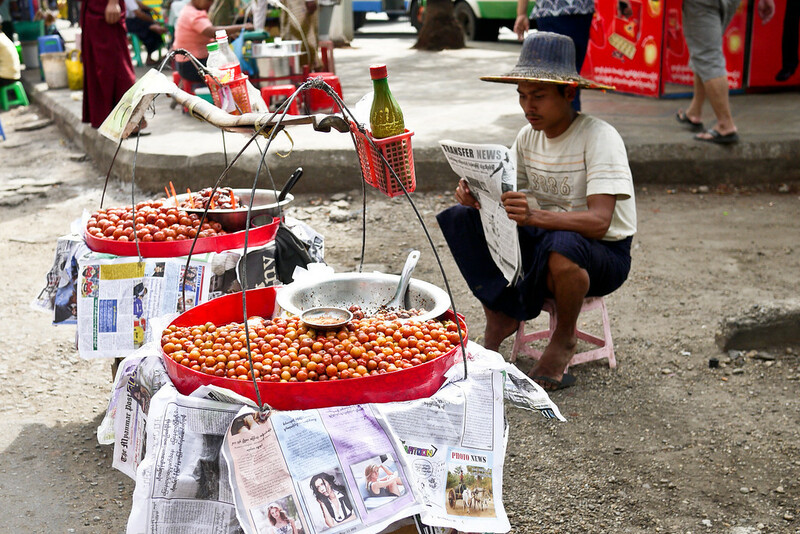 A vendor relaxes with the paper, knowing the sour plum fans will seek him out when they’re ready for a mid-morning treat! These very, very sour plums bake out in the sun and heat, so opt for them early in the day if you’re keen to sample. The flavor is a bit more potent than I can handle, but they’re quite popular with the locals! Indian samosas abound in Yangon. Deep fried donut-sticks were particularly easy to hunt down in Mandalay, and basically, when the craving for deep-fried struck, there were no shortage of offerings on the streets in the big cities. My wicked sweet tooth was beyond happy with the quick sweet options. I love portion control and that was easy in Burma since they opt for a small bite of jaggery candy, or a bowl of sweet jelly rather than a huge piece of pie/cake/ice cream like we would in the west! And when all else fails, find the fruit! Where can you find these treats? 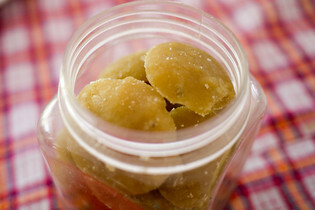 Look for roadside stands and little jars on your table with light brown solid chunks. Then sample away, like the Chinese tea, they’re free if they’re on the table! Also, I found a home compound making the sweet sugarcane treats outside of Inle Lake, so keep your eyes on the lookout! A popular treat all over, the pressed sugarcane juice with lime is sweet and refreshing, but be careful if it’s served with ice; choose a popular stand with clean ice storage! 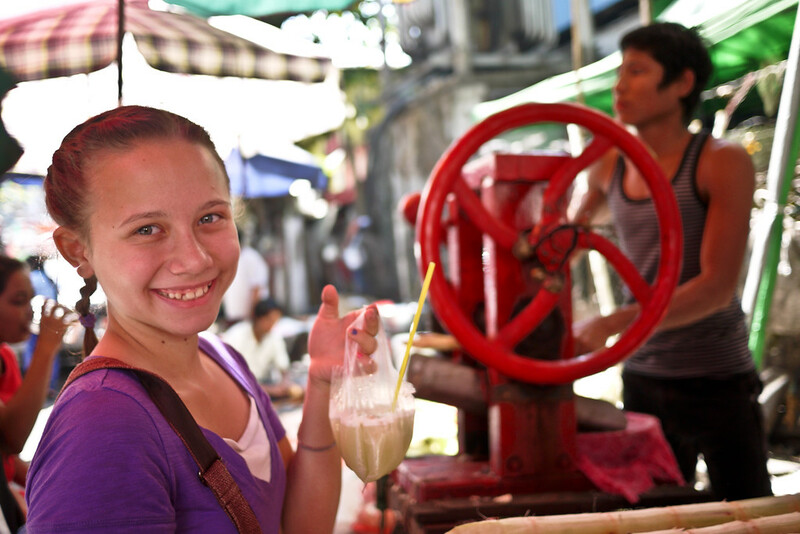 Sugarcane juice is available all over the streets of Burma. The vendor feeds sugarcane stalks through the juicing contraption, and Burma’s version of the juice comes with a generous squeeze of lime! Be warned though, this is a street treat, so avoid the ice and choose a vendor with a generally clean machine and stall! I’m a big fan of dessert but I steer well clear of all jellied desserts for some reason. They’re quite popular all over Southeast Asia, often served chopped, shredded, or cubed and with ice, coconut milk, tapioca, or a variety of other sweet concoctions. You don’t lack on options if you like this type of dessert! 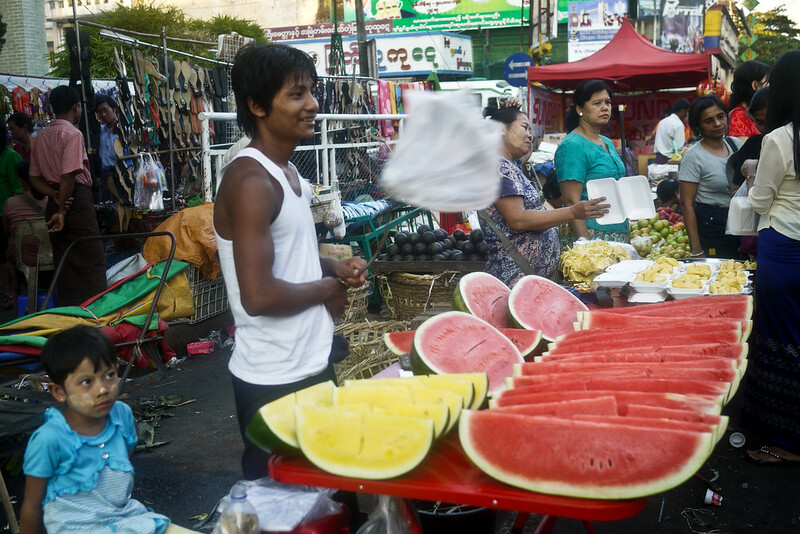 Like most of Southeast Asia, Burma has a huge supply of fresh fruit on every corner and it’s the healthiest way to end a meal. Ana and I stocked up on bananas and clementines before a bus ride and snacked on yellow watermelon for a fun spin on a familiar treat! Fresh avocado is also fantastic in the Inle Lake region. To use a trite expression, I could wax poetic all day about the delicious food I ate in Burma. Thank you to the my Burmese friend A for her tips, advice, and guidance. She proved invaluable at helping me better understand Burmese food culture before, and on the ground throughout my trip to Burma with my niece. Without her translating and introducing me to some of these dishes, I would have blindly passed through regions of Burma oblivious to some of the local flavors, foods, and customs. 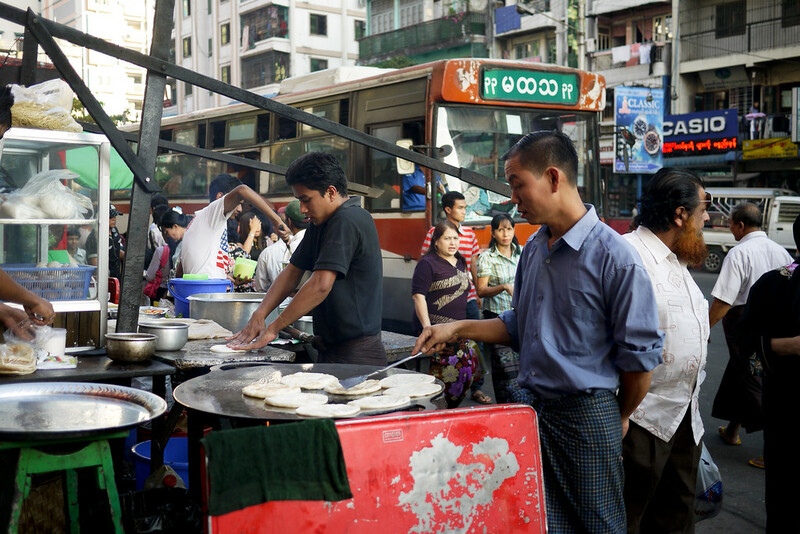 A street food vendor right on the sidewalks and in the midst of Yangon’s busy foot and car traffic! He’d doing it all right: clean work surface, 10 minute wait he’s so busy, and fresh and piping hot treats made-to-order. Being vegetarian means that I am sometimes much more conservative on my food choices than meat eaters, out of fear mostly. But that’s silly to some extent. Yes, there is sometimes a huge language gap in Myanmar. That gap is sometimes scary, but once I was armed with my term “thut thut luh” I felt pretty confident to tackle the menu with a bit more gusto than I might usually. And it paid off. Enjoy the dishes, and let me know what I missed so I can keep a running tally of the foods I still need to try! (And so others can try them too). If I got something wrong, please let me know and I’ll make the corrections. Now it’s your turn, that was a pretty exhaustive list, which one looks most interesting/tasty/unique to your visual taste-buds? There is no denying I am a big fan of Burmese food. It’s also surprisingly easy to bring home some of the best flavors. These cookbooks best capture the flavors of Burma; and the cultural reading in the books helps better understand the relationship between Burma’s food, history, and politics. Vegetarian Mohinga recipe: Traditional mohinga contains fish, but this vegetarian version is absolutely delightful. 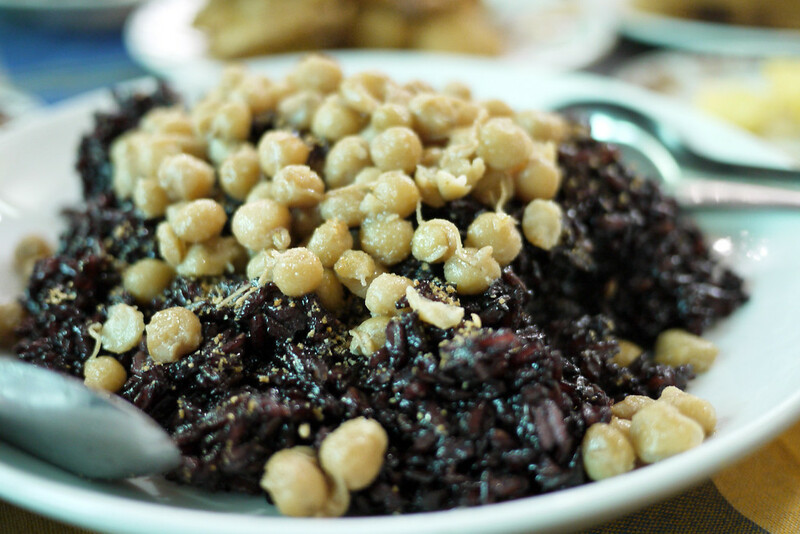 A family recipe shared by Cho Chaw, who is also the author of hsa*ba Burmese cookbook. Burma: Rivers of Flavor: A beautiful cookbook that not only explores the delicious foods of Burma, but the culture as well. I met Naomi, a James Beard award-winning author, on my travels in the region. She has a wonderful perspective on how food and culture meet and used that to infuse recipes, stories, food, and culture into one gorgeous book. Flavors of Burma: Cuisine and Culture from the land of Golden Pagodas: Another helpful cookbook that details recipes, as well as dining and serving customs, language, and festivals. Letters from Burma: Before traveling to Burma, it is a good idea to read about the country’s tumultuous history, and Aung San Suu Kyi’s fight for democracy in Myanmar. Yum! We have more to try, we would like that vegetarian hot pot. One thing we particularly noticed that I didn’t see mentioned was that the papaya seemed extra good. made good use of it prior to my initial visit to myanmar a couple years back. now i find myself refreshing my memory and salivating at a return visit this month! Yummy! Such a amazing post about Burmese foods! Thanks for this! this is a spectacular post! i’m headed to myanmar next month as a veggie and cannot wait. much appreciation for all your myanmar info, but especially this; my appetite has been thoroughly whetted! Aw yay! So glad that it was helpful, and I hope that you have a fantastic trip, Myanmar has long been one of my favorite places. Oh my.. i grew up in Australia but my parents were from Burma and then I lived there for two years in the mid 90s. Looking at your post made me miss living there so much!! Apart from all my wonderful friends.. I miss the food so much and my stomach is craving anything on your list right now!! I have lived in Cambodia since leaving Yangon and don’t nearly enjoy the street food as much as in Mynamar.. ! Thank you for this wonderful culinary trip you just sent me on .. now just to visit there again one day! But the biggest problem visiting was that we would go back and our relatives would feed us so much all the time that we were never hungry enough to really enjoy everything.. quite a dilemma!! Would love to go back to live there again. Great you get to go back soon.. Look for something called Pear Bpyo (sorry I can’t transliterate very well).. it is a soybean product.. kind of fermented.. they sell it up near Inle area in little dried cakes which they do lots of things with – it is a salty, strong flavour – very tasty – usually eaten with rice .. but can be prepared many different ways .. I had some local vegetarian friends and this was a staple in their house. Chim baung is another one – a sour green leaf made into fried curry dish or a soupy curry.. possibly often with fish.. maybe hard to find eating out though. Then another dish is the Ohn-no cow-swear (sorry! that is spelt funny).. a soupy coconut noodle dish usually with chicken .. you should have seen it.. but if there is somewhere that does a vege version (which my mum does at home and my friends there).. it is really delish. I should ask my friend if there are any places which sell a vege kind..
sorry the pear bpyo is the dahl like curry they serve with the naan for breakfast at tea shops..
the soy bean stuff i was talking about is called pear bo.. and the dried cake things are for cooking.. so not sure how where they would sell it already cooked up.. but check around if you go up to inle area. thanks for all that info, i’m starving now. why are you vegetarian ? Thanks for loving our Burmese foods. So glad you enjoyed the food post! 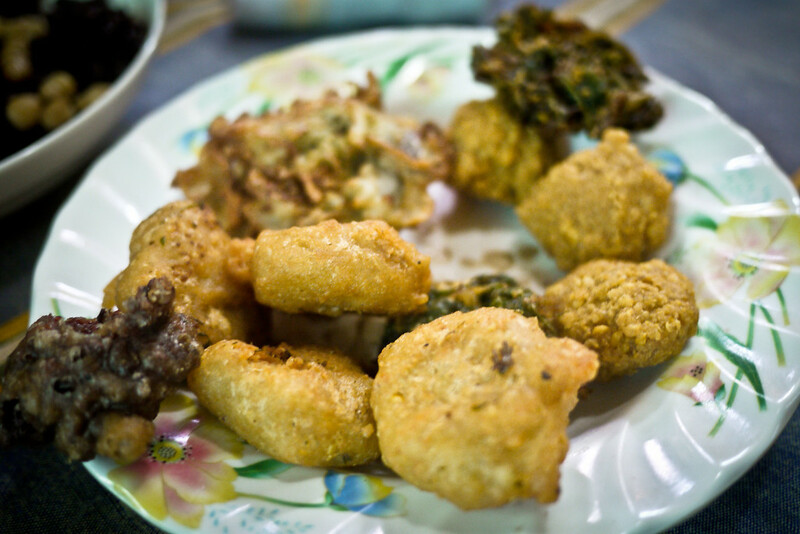 I miss the Burmese food all the time and can’t wait to return one day. Best of luck with your book and site! Hi Shannon, this post is so good! Congratulations! I have tried all of them and I’m in love with this country and food! Amazing! Hi Shannon, a big thanks for this guide, I’m about to go to Myanmar 7th of Jan, and this really helped me, going as a vegan :). Now just to get the pronunciation right! Hey, Shanon there are 2 types of laphet thoke. the one with the veggies and without veggies.Laphet thoke with veggies serve casually.Without the veggies serve occationally (formal), for example,traditional ceremony. But anyway there’s no rules for that, you can eat just the way you like. Shannon, this is an inspiring and comprehensive post. Although everything looks worthy of trying I must admit I’d like to try the fermented bean paste (pone yay gyi). What an awesome list and set of photos Shannon! I don’t think we tried even half of what you’ve got here while we were in Burma. I guess that means we’ve got to hit some of these dishes up on a second go-around. Thanks for a great write-up, and also for some really great travel tips on your blog! Thanks a lot for compiling this huge list Shannon. It is definitely going to be very helpful for vegetarians travelling to Myanmar. I always struggle with veggie food when I am travelling. Thanks for posting this and great food shots! The food looks absolutely amazing! My boyfriend and i are starting out 2 year backpacking trip in Japan in September and traveling through Asia before migrating over to Europe. I am particularly excited for Burma as it seems to be one of the few countries left in Asia that hasn’t been exploited by tourists yet. I also love to cook (I have a food blog – http://avocadopesto.wordpress.com) so I am especially excited for all the food and hopefully will be able to learn some recipes/cooking techniques while we’re over there ! The food looks absolutely amazing! My boyfriend and i are starting out 2 year backpacking trip in Japan in September and traveling through Asia before migrating over to Europe. I am particularly excited for Burma as it seems to be one of the few countries left in Asia that hasn’t been exploited by tourists yet. I will be in SF for a couple of weeks in July. I will try and find it! do you know the name of it? Yep, Burma Superstar, :) Let me know how it tastes! Fantastic blog yet again Sharon, though I must be partial when I say that no other country beats India when it comes to pure unadulterated veggie cuisines. I often wonder though….how come most vegetarians-regardless of race, nationalities and cultures- tend to be women? Honestly, I’d reckon out of every 10 vegetarians out there, 8 are women!!! Even though I do eat everything (meat and seafood included), honestly, I think some of absolute best Burmese dishes happen to be vegetarian. I just couldn’t get enough gyin thote and lahpet thote when I visited. Love the dishes you highlighted, your photos and descriptions. Great guide! YUM! Such a great post! I definitely have to run and make myself lunch after seeing all of this! I know what you mean about crossover foods. I feel like that’s all I eat (In America)! My sister is a vegetarian and it’s really helpful to find blogs like this, given that sometimes we have no idea if there will or won’t be veggie options. Thanks for sharing! Best post about food in Myanmar, yet! – Seaweed salad is “Japwint Thoke” in Burmese. It’s not actually seaweed (even though that’s what the menus say). It’s some sort of freshwater plant that no one can figure out the name for. – Vegitable hotpot is “Myae Oh Myi Shae”; “Myae Oh” is the clay pot and “Myi Shae” is the name of the curry/sauce. Lastly as a word of caution, if you say “theq theq lo” it usually just means that they won’t add meat to it. It doesn’t necessarily mean that there isn’t fish paste / animal stock in it. But, they’ll usually get the idea. I think I’m going to eat some tohoo nooway tonight; even though I had it last night. It’s just so yummy. This has made me SO excited to get to Burma!! Mmm, looks tasty! I’m not vegetarian anymore but I still love a good vegetarian meal (most of the time, if possible). I really want to eat that Shan Tofu soup! Ooh my mouth is watering so much right now – thank goodness it’s almost lunchtime! wow – great pictures. didnt know burmese vegetarian food was so varied and so unique. Thank you Shannon! I have offically added Burma to my travel list because of the food! It looks & sounds so amazing. I do have a question…the term you used to have vegetarian food, how is it pronounced phonetically? I always mix up vowel sounds in other languages and it would be helpful to know the sounds a bit better. Thanks. luh – like “low” as in the ceiling is low. But again, a bit more of an “uh”. Looks amazing! I have never had Burmese food before but this has inspired me to try it (as well as put Myanmar on my “to visit” list!) I would have to say the one that looks tastiest to me was the tea leaf salad (lephet thote) – those tea leaves are intriguing me! Looks soooo delicious! As a veggie traveller too, I know how challenging it can be to find vegetarian food on the road. I think I know the word for vegetarian in at least 10 different languages :). Thanks for this! Mouthwatering photos and list of food. Thanks! Will definitely be a useful reference when we go to Burma. Oh my goodness, what a fabulous resource. I’m determined to make it to Burma sooner or later and I’ll definitely be consulting your veggie eating guide when the day comes. Thanks!